In 10-inch skillet, melt 3 tablespoons butter over medium-high heat. Add apple slices; stir to coat with butter. Sprinkle with brown sugar. Cook 5 minutes, stirring occasionally. Stir in 1 tablespoon bourbon and the bacon; continue to cook until apples are tender. Remove from heat; cover to keep warm. Meanwhile, in medium bowl, mix pancake ingredients just until blended. Heat griddle or skillet over medium-high heat (375°F). Brush with vegetable oil if necessary (or spray with cooking spray before heating). For each pancake, pour 1/4 cup batter onto hot griddle. Cook until edges are dry and bubbles form on top. Turn; cook other side until golden brown. In microwavable bowl or measuring cup, microwave syrup and 2 tablespoons bourbon on High until warm. Stir in 1 teaspoon butter until melted. 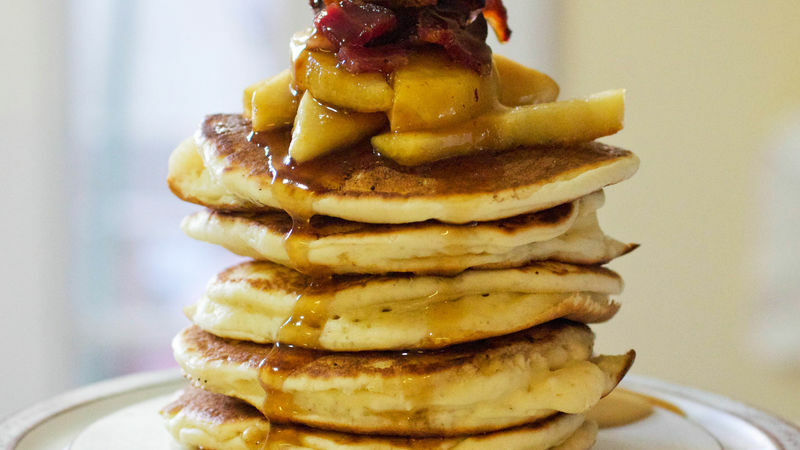 Serve pancakes with bourbon-apple-bacon sauce and bourbon-maple syrup. Stir pancake batter with a wire whisk or fork just until the ingredients are moistened. Any remaining lumps in the batter will disappear during cooking. To test if the griddle is ready for cooking pancakes, sprinkle with a few drops of water; if bubbles jump around, the heat is just right.